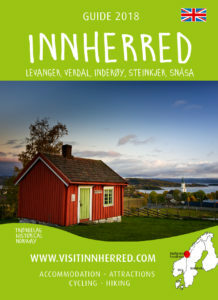 Tourist guide to Innherred filled with exciting experiences, farm food, nature- and cultural experiences, including Stiklestad and The Golden Road. Innherred consists of the municipalities Steinkjer, Levanger, Verdal, Inderøy and Snåsa. Innherred offers an insight into all of Norway’s history, from the middle ages right through to today. Major historical events in recent times have also left their mark on the region. Why not come and experience our rich history and cultural heritage for yourself ? The Innherred guide (tourist guide for the Innherred region) is your guide to exciting experiences in Innherred! We have put together tips and useful information about fishing, hiking, accommodation, food experiences, biking and much, much more. The guide have several sections with information and links to more extensive information on our website. Additionally, the guide is divided by municipalicy with an overview of accommodations, attractions and things to do etc.